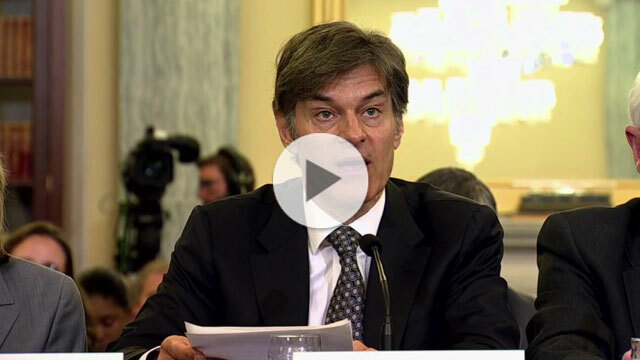 Earlier this week, Dr. Mehmet Oz faced TV cameras for an appearance unlike any he's made before. Lawmakers called the TV personality to testify at a hearing on weight loss product scams after endorsements made on his nationally syndicated show. Missouri Democratic Senator Claire McCaskill called on Dr. Oz, who is a cardiothoracic surgeon and host of The Dr. Oz Show, to be more careful when describing the alleged slimming powers of substances like green coffee extract, raspberry ketones, and fiber pills. Watch the clip from Time.com above. Problem is, enterprising supplement companies have been known to quickly manufacture products containing ingredients mentioned on the show—like green coffee beans—and then illegally use Dr. Oz's name, face, or show footage in marketing the product, according to the Associated Press. Dr. Oz says he has never endorsed specific supplement brands, or received money from their sale. Still, McCaskill urged Dr. Oz to take more responsibility. "You are being made an example of today because of the power you have in this space," she said. "We didn't call this hearing to beat up on you, but we did call this hearing to talk about a real crisis in consumer protection. And you can either be part of the police here, or you can be part of the problem." The Federal Trade Commission has been cracking down on supplements that make false weight-loss claims. A 2011 FTC survey found that more consumers were victims of fraudulent weight-loss products than of any of the other kinds of fraud included in the survey. If a product looks too good to be true—like, it claims to help you lose weight without diet or exercise—it probably is. The FTC created a list of seven common claims to watch out for, so read up before you shell out.